On-the-go updating of the FIFA world cup stats and news (check the FIFA 2010 schedule) on mobile phones is what one would need, as no one is real free to always sit in front of the TV and watch every game. Earlier I shared the World cup apps for iPhone and blackberry, and as the world cup has just started, the need for keeping up with the competition on the android mobiles is also on a high note. And the developers have not been lazy, as there are a lot of apps made for the Android phones, to display all the ongoing updates about the FIFA 2010. 1. 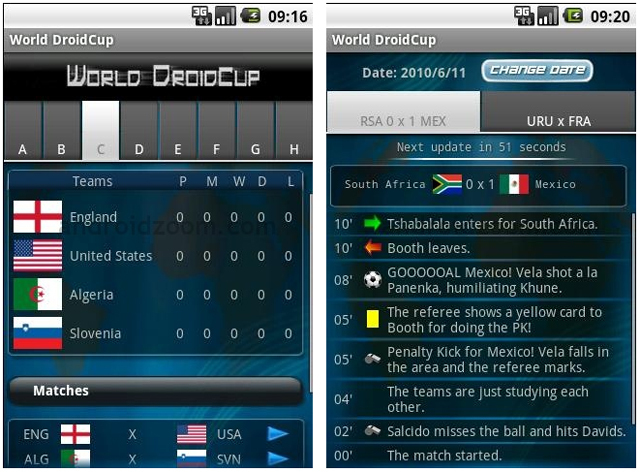 World DroidCup – Provides a set of powerful and user friendly features to follow the World Cup 2010, like info about groups, table of matches, finals, artillery, stadiums visualization in Google Maps and a Real Time Match System(RT). This is the most downloaded and the best made app for Android phones, and is packed with loads of features. A list of groups, the points table, and the fixtures are available from within the app. Everything is easy to navigate and read in the app. 2. World Cup Soccer 2010 – Latest info on matches, teams, groups, venues and your favorite teams with up to the minute updates. 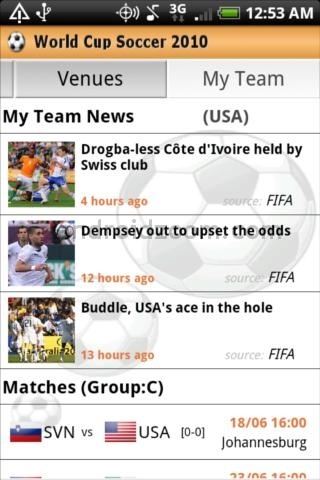 Provides Real-time news and info on the world cup from FIFA, Google, Yahoo, Reuters, AP and BBC. It also includes Photos and Video from Flickr and YouTube. Easy and simple user interface with flip navigation, and I really liked the simple, neat and light colors that won’t strain your eyes if you are focused to it all the time too. 3. World Cup Essentials – This is another superb app, that brings you some real-time and good information and countdown for some of the major events in the world cup. The kick-off, the finals etc. The features include local time, results, standings of all the teams, calendar, history about all the matches, details about the stadium, mascot history and much more. 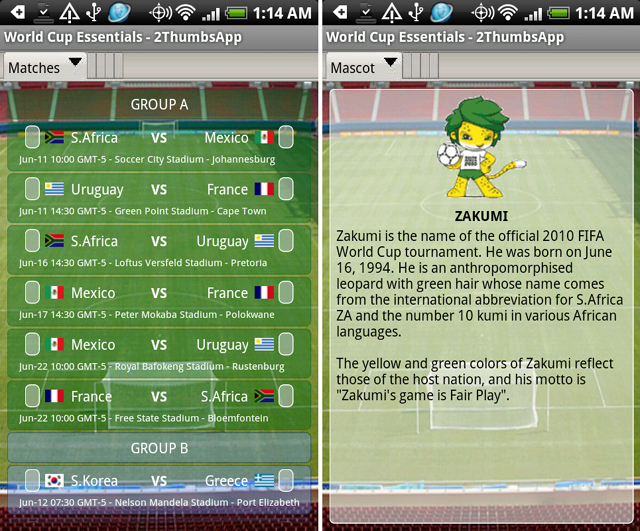 This app also includes information about the teams, players etc. The navigation is not that great to talk, but the information you need is enough to fill your quota of needs.